From Chaucer to superhero comics, our classes teach students about print media. If you want to know more about Jane Austen’s novels or Shakespeare’s plays, we have the courses for you. If you want to know more about young adult fiction and the poetry of hip hop, we have courses for you, too. Our English major features classes on writing from around the world, including the full diversity of American culture. Our Beyond the Book Club, our peer advisors, our Cafe Voorhies pop-up study space, our London Study Abroad program, our annual award ceremony: These represent just the beginning of our events and programs for majors that let them know they are always welcome in Voorhies Hall. For answers to the question “What can I do with an English major?” consider what actual UC Davis English alums have told us. Our majors go on to careers in the U.S. armed forces and Silicon Valley, medicine and the law. Our graduates are journalists and veterinarians and teachers. Some of them travel — like Jackie DesForges ’10, who works as a social media director for Rail Europe. Some of them code — like Chris Tung ’11, whose startup Huttle went live in 2016 and was profiled on CNBC. Some of them write — like Anthony Swofford ’99 (who wrote Jarhead: A Soldier’s Story of Modern War), the celebrated short-fiction writer Jodi Angel ’01, Pulitzer Prize-winning reporter Matthias Gafni ’98 from the San Jose Mercury News, and award-winning San Jose Mercury News sports journalist Daniel Brown ’92, who came back to campus in 2016 to talk to students. The connection between English and fields like teaching, journalism and public relations is probably pretty clear. You can see the roots of those jobs in skills we value, like the ability to write a persuasive argument that has a clearly articulated thesis and demonstrates close analysis. The fact that we are ranked in the top 20 of English departments nationwide by U.S. News & World Report is proof that we are excellent at teaching these skills. Studies show that Americans are reading less, but as a recent Los Angeles Times article says, don’t blame today’s college students: “When it comes to reading books, the kids are all right,” reports the author, Michael Schaub, about a new Pew Research Center survey. Students entering college today read more, and read more for fun, than older American adults. And for good reason: There’s more to read than ever. Publishers Weekly reports that book sales are up three years in a row. It’s true, English majors read serious literature by serious writers: Shakespeare and Jane Austen, Charles Dickens and Virginia Woolf, W.B. Yeats and Chinua Achebe, Ralph Ellison and Sylvia Plath, Claudia Rankine and Junot Díaz. They also learn how to take seriously a whole range of works that might be surprising to find in an English class like Ta-Nehisi Coates’s comic book Black Panther, mysteries by Agatha Christie, Michael Crichton’s thriller Prey, or J.K. Rowling’s Harry Potter and the Sorcerer’s Stone, not to mention the video games and movies in our visual media courses. English majors can learn how to analyze video games like Bioshock and early Hollywood cinema as well as the poetry of Chaucer and the fiction of Mark Twain. By training students to analyze writing and to write creatively (our creative writing classes are rightfully popular), we’re preparing them for a changing, more diverse world. Because our students have such varied career interests, it should not be surprising that they often double major. 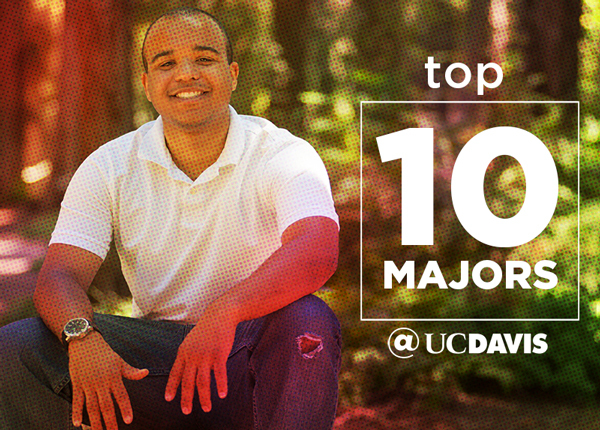 Currently, our majors are completing second majors in 38 different fields at UC Davis. We also have a popular minor in English. Lindy Gervin ’13 is a technical writer for Kratos Security and Defense. English also provides tools for success to graduates who work in what we might think of as “science jobs.” A surprising number of our students head to medical or veterinary school. Medical schools are increasingly recruiting English majors, as reported by NPR. Students interested in medical careers while being English majors will discover that UC Davis English professors Hsuan Hsu and Elizabeth Freeman are doing research in the new field of “medical humanities,” and we look forward to offering more courses in this area. In addition to our faculty, we have a great team of staff advisors and undergraduate peer advisors who offer our students personalized guidance on how to make the most of the major. We are especially excited to welcome students who are the first in their generation to attend college. We published a story recently on our website about our faculty who were the first in their families as well. We invite students and parents to visit us in Voorhies Hall, check out our website, like us on Facebook and sign up for our quarterly e-newsletter. John Marx, chair of the UC Davis Department of English, is focused on connecting English majors to careers. His current research focuses on contemporary mass media, including novels, and he has a new book coming out in 2018: Media U: How the Need to Win Audiences Has Shaped Higher Education (Columbia University Press).